My father, who owned and operated a tour company in Casablanca, Morocco for many years, took me along with a German tour group to visit a traditional "Wedding Fair" at Hadiddou Imilchil, a Berber village in southern Morocco. While I knew that many Berber Fairs combine a local Saint's Day with a regional market event, only at September's 'moussem' (pilgrimage) of Imilchil, have I seen such a colorful pageant, with instant engagement, and a mass exchange of marriage vows. 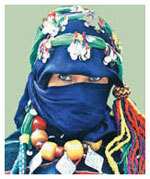 Berbers have inhabited North Africa for centuries, some being of Caucasian ancestry, with fair complexions and blue eyes. Visitors may think of Berbers as exotic outsiders, yet they preceded the Arabs in settling Morocco, and they remain the country's main culture. This is expressed by the phrase, "Morocco is Berber - the roots and the leaves of freedom." A nod and a wink: The language of gesture is as clearly understood by these people as the spoken word. By having a friend help him choose a bride (with often no more than a silhouette and two dark eyes as a clue) the groom gets overcomes his shyness. All day long, in pairs, these men weave in and out amongst a cluster of anxious brides. Then, welcomed by a shy glance or a quick nod, the suitor will stop to speak to the lady, encouraged by a signal from his friend's reassuring hand. Who wouldn't enjoy steamed semolina, topped with a meat and vegetable sauce called couscous? Or tajines. a vegetable stew that may contain rabbit, lamb, goat and chicken meat, combined with prunes, apricots or raisins. Pastilla (baked pigeon pie) is made of layered filo pastry, with nuts and spices, and coated with sugar. With your morning coffee, try a light deep fried Spanish doughnut, we call sfinj, or cornes de gazelle pastries. Africa Travel Magazine's Associate Editor covers destinations and events in Francophone Africa. She has lived in five West African countries, working for Air Afrique, Royal Air Maroc and Citroen. As a Travel Agent, she worked in North Africa, where her family operates an inbound tour company, and later in Tahiti and Cambodia. Since I read your article about Morocco, we took a group of African American Female educators there last year and had a wonderful time. Hope to take a group again next year. Briefly, the experience was wonderful. We spent most of our time in Agadir with a one night excursion to Marrakech. We stayed at Club Valtur and the resort was great, albeit very Italian. I didn't learn much about the people or culture of Morocco, hence the need for a second trip. However, I did make a few friends (smile). Morocco is a fascinating if you love sensory experiences or sensory overload!! The experience started as soon as we boarded the Royal Air Maroc flight, and continued for the entire trip. I'll never forget the sights, smells and sounds of the souk at Marrakech!!! Shopping was great as well. As I said, I prefer to get a little more into the country itself, but it was a great 'spa experience'. The trip was billed as "Sister Scholars at the Spa"!!! Actually, Morocco was a great value I would go again for that reason alone. I started writing an article several months ago and would be happy to share my thoughts with you further. and other North or West African destinations.